Designing structures with minimal environmental impact is now a common concern in the construction sector. Conventional structural design practice usually involves ensuring that the strength and deformation of structures meet the required limits to cope with the worst load cases. However, most of the time, such structures experience loading much lower than the design load meaning that they are effectively over designed for most of their working life. This fact leads to consider that building structures could be adaptive rather than relying only on passive load-bearing capacity. Active control has been used in engineering structures for a variety of purposes. The most widespread application in civil engineering has been in vibration control. A few have investigated the potential of using adaptation to save material, but whether the energy saved by using less material makes up for the energy consumed through control and actuation has so far received little attention. 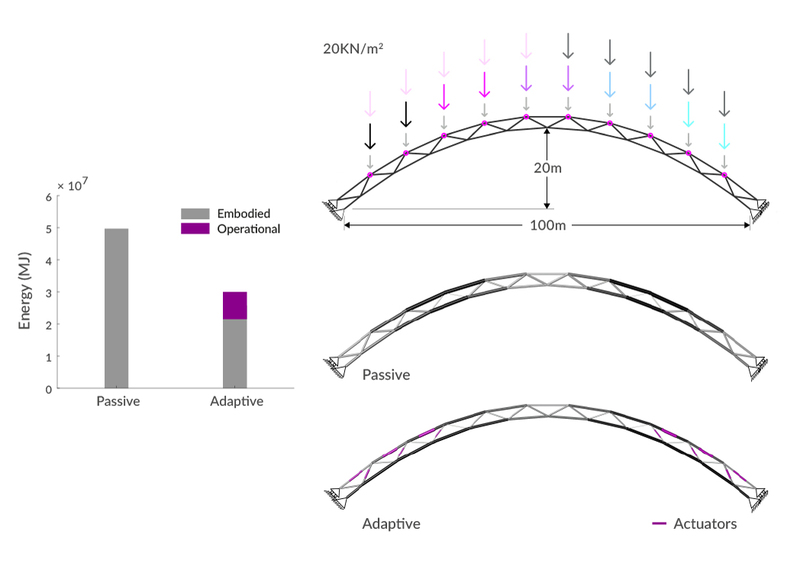 During his doctorate, a research project collaboration between the University College London and Expedition Engineering, Gennaro Senatore formulated a new methodology to design adaptive structures. Adaptive structures are structures capable of counteracting loads actively by means of sensors, control intelligence and actuators. This method is illustrated diagrammatically in figure 1 which shows the total energy of the structure as a function of some notional degree of active control of the structure. The total energy is made of two components: embodied and operational. In this method, embodied energy refers to the energy needed for extraction and manufacturing. For a completely passive design the embodied energy dominates the total energy: members are designed to bear 100% of the design loads to meet strength and serviceability requirements. By contrast for a highly active design, the embodied energy will be small but the operational energy necessary to control the structure throughout its lifetime will be high. The active-passive system that corresponds to the minimum of the total energy is the optimum sought. 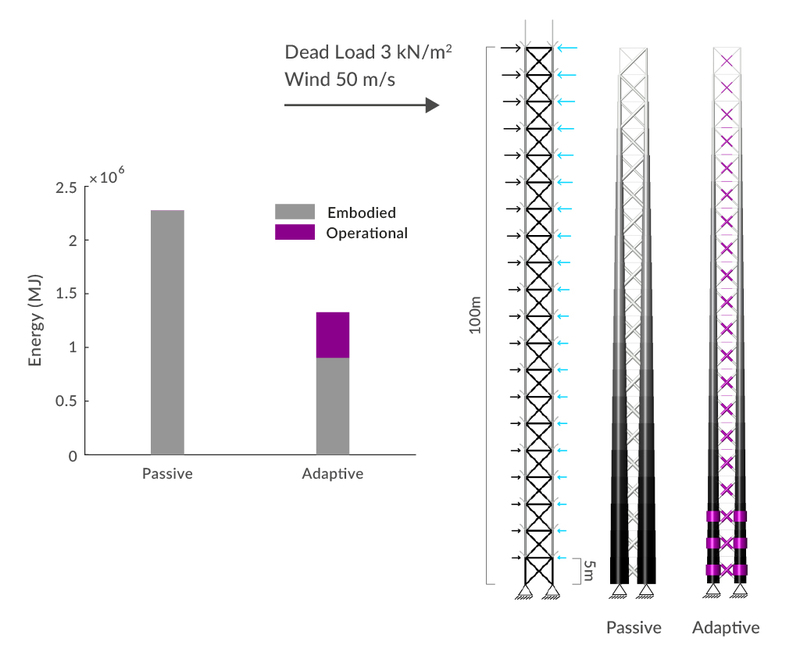 The adaptive structure is designed to cope with ordinary loading events using only passive load bearing capacity whilst relying on both passive resistance and active control to deal with events that have a smaller probability of occurrence (e.g. wind storms, snow, earthquakes, unusual crowds but also moving loads such as trains). Instead of increasing the stiffness using material mass, strategically located active elements (actuators) provide controlled output energy in order to manipulate actively the internal flow of forces and to change the shape of the structure. In this way the stress can be homogenised and deflections can be kept within desired limits. However, the actuators only activate during rare occasions when external loading reaches a certain “activation threshold” (e.g. gale-force winds, larger crowds of people etc. figure 2). Therefore, the operational energy is only used when necessary. 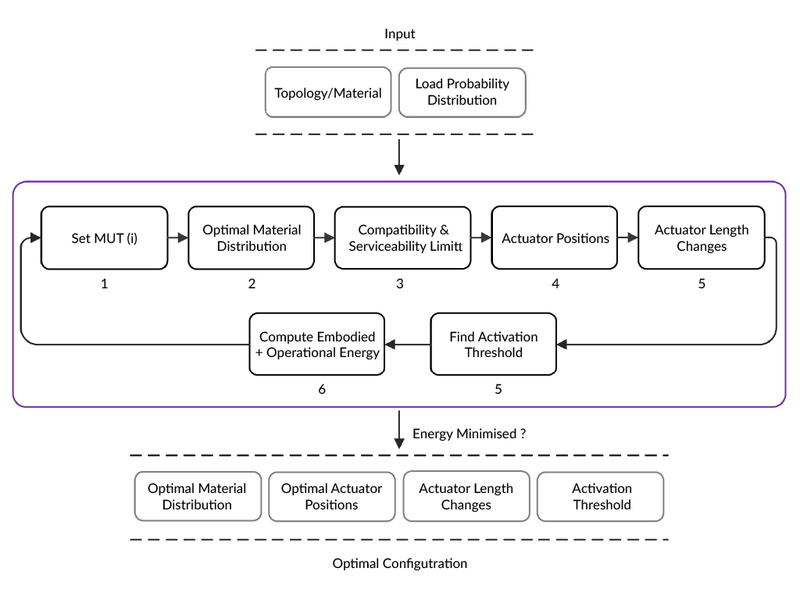 The Adaptive Structures Design Method (figure 3) has been developed to find the optimal load path (i.e. the flow of internal forces) and corresponding arrangement of material to achieve the minimum possible lifetime energy. To do this it needs to design a structure with an optimal combination of active and passive behaviour. The design algorithm controls this balance of active and passive by varying a parameter termed the material utilisation factor (MUT – step 1). If the MUT is high, the structure will have a low activation threshold, be very light (minimal weight passive structure) and therefore active system will use lots of energy for structural adaptation. Section sizes of the structural members are then determined (Step 2) so that they have sufficient capacity for the worst expected effect from all possible loads and load combinations for strength only. If a change in the loads causes a deflection that violates a serviceability limit state (SLS), the load path must be redirected and displacements controlled by the active system (Step 3). For this reason, the method finds the minimum number and optimal position of active elements (i.e. actuators) (Step 4) whose work - in the form of length change - is needed for displacement correction and load path redirection. The process is repeated iteratively to find the configuration that corresponds the minimum whole-life energy. 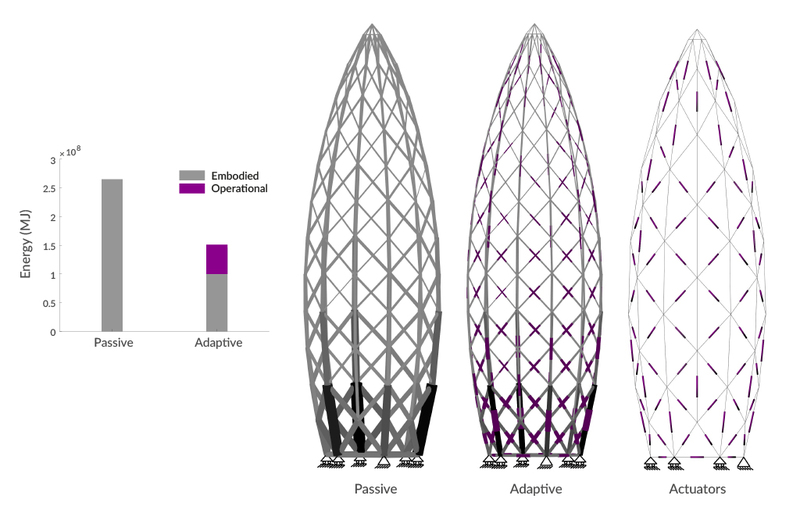 Extensive numerical simulations, which compare adaptive solutions against equivalent passive structures optimised using state-of-the-art methods, have shown that the total energy (embodied + operational for a 50-year design life) could be significantly reduced. Three case studies are presented here. The structure shown in figure 4 represents a section of a multi-storey building. The structure shown in figure 5 represents a section of a typical hangar building made of planar trussed portal frames. 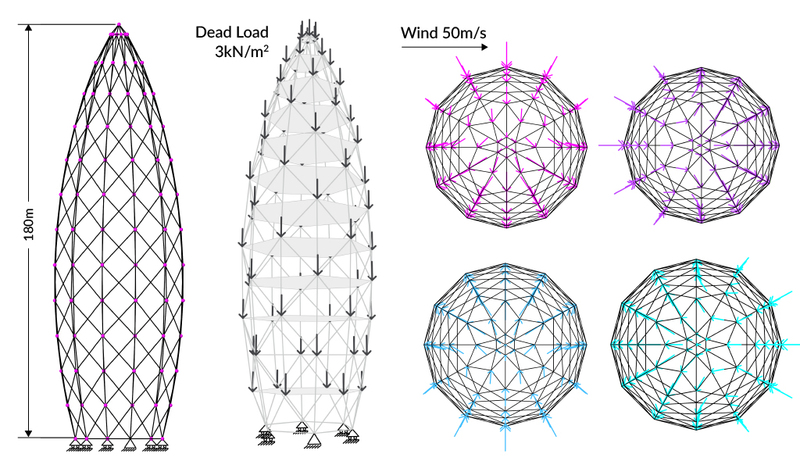 The structure shown in figure 6 & figure 7 is a simplified model of a tower building known informally as the “Gherkin”, a skyscraper in the City of London. This last building is assumed to carry external loads only using its own exoskeleton as structural system (i.e. no cores). The external load is modelled using a stochastic distribution which is representative of typical building loading scenarios (design life of 50 years). The limit on deflection used in these examples are those commonly used for the design of civil engineering structures. For instance, main span/360 to limit displacements of structures spanning horizontally and height/500 to limit total building drift. Results show that the energy savings stay in a range from 30% up to 70% for very slender structures. An optimal region in which adaptive structures outperform their optimised passive versions both in terms of energy and monetary cost savings was identified. This is broadly the region of stiffness-governed structures (e.g. long-span structures and high-rise buildings).